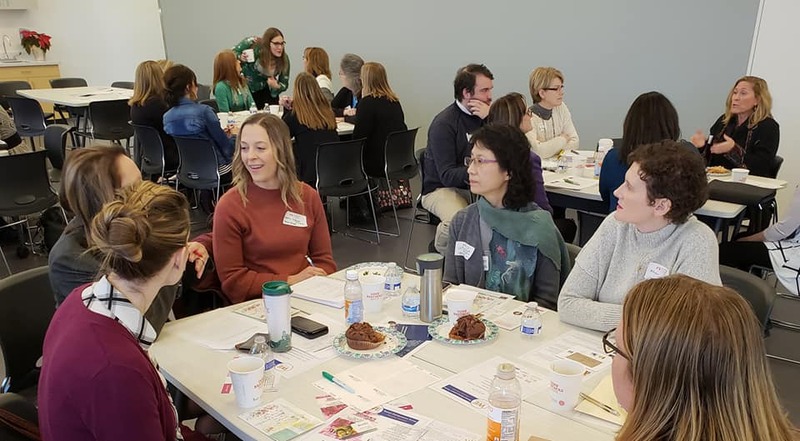 Photo courtesy of Rochester Area Economic Development, Inc.
Last week over fifty intrepid women braved a winter storm to attend a Women Entrepreneurs Forum on funding sources. The event, led by Rochester Area Economic Development, Inc. and Saint Mary’s Kabara Institute for Entrepreneurial Studies, provided a connection point for business women in the local ecosystem and brought to the surface funding pain points experienced by these innovators. The forum included a panel discussion featuring Jennifer Gowin, a Commercial Local Officer with Premier Banks Rochester, Cathy Connett, CEO and Managing Partner of the Sofia Fund, an angel investment fund for high growth potential women-led businesses, and Laura Hart, Loan Officer with the 504 Corporation. Although at the national level, women-led businesses receive less investments and less capital via bank loans than male-led companies, Gowin and Hart aren’t necessarily seeing this phenomenon at the local level. Though Gowin sees the same size of business loans being awarded to men and women, she’s observed more men than woman applying for loans to fund their company. Hart explained that the funding is out there. But it’s unclear to her if women are not aware of these opportunities or choose to not pursue them. In the venture capital and angel funding world, where there are more male than female investors, the picture is a little more lop-sided. “Typically, unfortunately, like invests in like,” Connett explained. Although there are less women investors in general, female business owners, Connett said, also typically wait too long to seek equity investment than their male counterparts. “Women often want to have everything lined up before they [seek funding]. Whether it’s a bank loan, or whether it’s equity, or anything else,” she explained. Women, Connett said, are just as likely to be risk takers as men. “But I think we don’t want to expose ourselves to risk sometimes,” she explained. When looking at loans and investments to any business, the panel said, several factors contribute to the final decision. As a bank, Gowan explained, her employer is fairly conservative when granting loans. Banks typically assess business collateral. If light, the bank will also look at personal assets and personal credit. They will also closely assess the business owner and her level of understanding of her business and the associated industry plus her ability as a founder to overcome any associated risks. The team’s capacity to overcome adversity, Connett explained, is a significant factor in angel and venture capital investment. Excitement, passion, the ability to tell a compelling story, and a clear need for the business in the community are all vital pieces to secure funding, the panel explained. Resources to fund female, and male, owned businesses are out there. As women, we just have to put ourselves out there and go after it. Future events and workshops like this funding forum are in the planning stages to address additional unmet needs for local business women.